High quality screw-on fitting with cylindrical thread (G1/4"). The hose is fixated and sealed tightly by the union nut, yet it can be easily removed with one hand. This system ensures maximum safety and ease of installation. With integrated 1/4" Perbunan(r) seal. Extent of delivery: Screw-on fitting with O-ring seal. The fitting is angled by 90° and can be rotated freely. 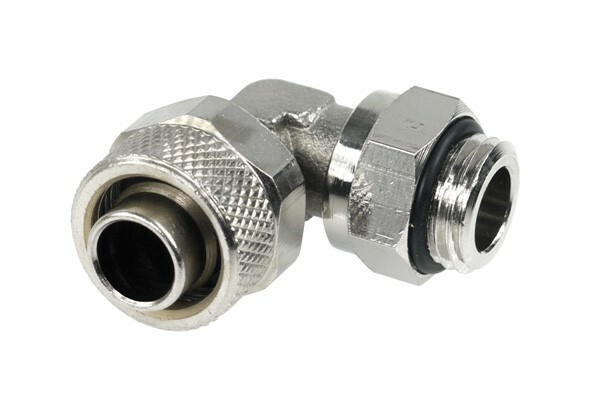 The 13/10mm fittings are compatible to 13/10mm and 12,7/9,5mm (3/8") hoses.